with Maria Elena Buszek. Craftivism: A Special Edition of Utopian Studies, (Penn State Press) volume 22, no. 2, 2011. Coined by artists and collectives in the wake of the September 11th, 2001 attack on the World Trade Center, the term “craftivism” relates to creative, traditional handcraft (often, assisted by high-tech means of community-building, skill-sharing, and action) directed toward political and social causes. For this special issue of Utopian Studies, we invited practitioners, scholars, and curators to submit work related to the history, criticism, and myriad practices of craftivism. Subjects and strategies include: historical and present examples of activist practice that use craft; issues of production, manufacture and use that intersect with craftivism; discussions of the successes and limits of craftivist practice; considerations of feminist craft practice that traverse (or are collapsed into) wider social issues and movements. Maria Elena Buszek and Kirsty Robertson. “Introduction,” pp. 197-200. John Freeman-Moir. “Crafting Experience: William Morris, John Dewey and Utopia,” pp. 202-32. Jack Z. Bratich and Heidi M. Brush. “Fabricating Activism: Craft-Work, Popular Culture, Gender,” pp. 233.60. Nicole Dawkins. “Do-It-Yourself: The Precarious Work and Postfeminist Politics of Handmaking (in) Detroit,” pp. 261-84. Sarah Amato. “Fit to a T: Spray-On Clothing, Craft, Commodity Fetishism, and the Agency of Objects,” pp. 285-302. Kristen A. Williams. “Old Time Mem’ry: Contemporary Urban Craftivism and the Politics of Doing-It-Yourself in Postindustrial America,” pp. 303-20. Erin Morton. “The Object of Therapy: Mary E. Black and the Progressive Possibilities of Weaving,” pp. 321-40. Buszek and Robertson. “Introduction to Artists’ Statements,” pp. 342-43. Sarah Corbett and Sarah Housley. 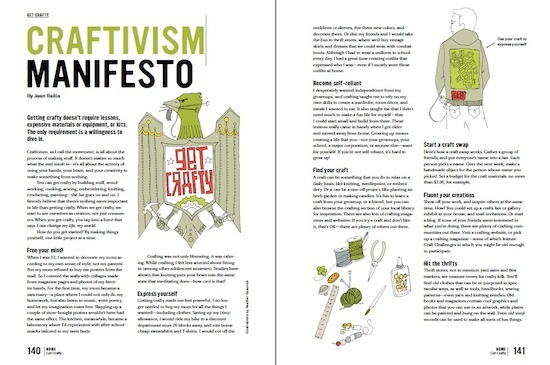 “The Craftivist Collective Guide to Craftivism,” pp. 344-51. Travis Meinholf. “Common Goods,” pp. 352-57. The essays can be downloaded from here.